Last week I spoke at the Brandify Summit in LA. Great event and great audience – full of people who run the local SEO for big companies (e.g. Wal-Mart, Disney, Walgreen’s). Be sure to check out the further reading in my second-to-last slide (#47). By the way, if you found that useful, you’ll love this post. Any slides that weren’t clear? Great preso Phil, wish I could have been there in person. I’d love to know your content beyond the slides for this. Such a great topic to get into for big brands and so many struggle with such granular activation of their customers. Many seem to just “let it happen” and then some over do it with an all out marketing focus for a brief stint. Those that succeed are consistent at every level of the customer experience and communication to activate. 1. More and more of the action happens in the SERPs, before customers ever reach your site. By “action” I mean due-diligence, decision-making, and (in some cases) conversions (e.g. “get a quote”). 3. When customers have a choice between different providers, that’s bad news for any business that isn’t willing to rack up the reviews as the best SMBs rack them up. Big brands will never be quite as nimble, but there are ways they can do decent job of encouraging reviews. 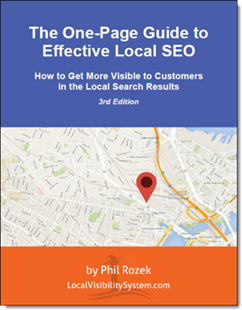 I came here from your article “How Can You Tell A Competitor Does Effective Local SEO”, but when I came here I saw the slide deck is not working. Do you have any advice on how to gather reviews for local businesses? Thanks for letting me know, Vincent. Sorry for any hassle.